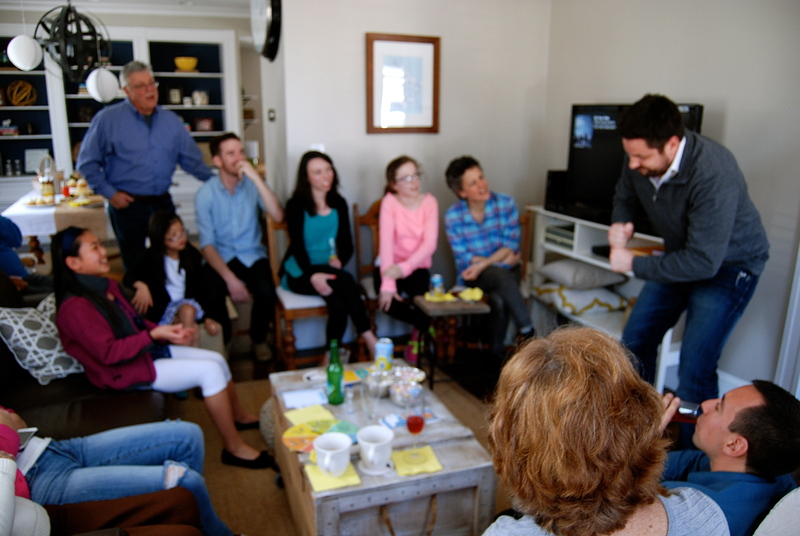 There’s nothing that says Happy Easter like a Family Charades Tournament! Well at least it did for us! Too old for egg hunts and too young for sitting around watching each other eat ham, we decided to host a lively Easter Brunch with some friendly competition. 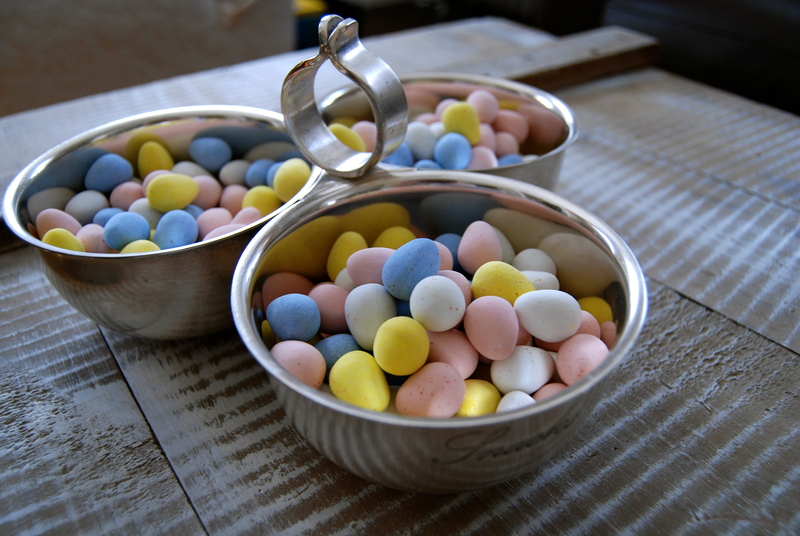 The morning started with two of my favorite things- preparation and mini eggs. Having cleaned the house from top to bottom on Saturday, I staged my table and had all my platters and serving utensils ready to go. 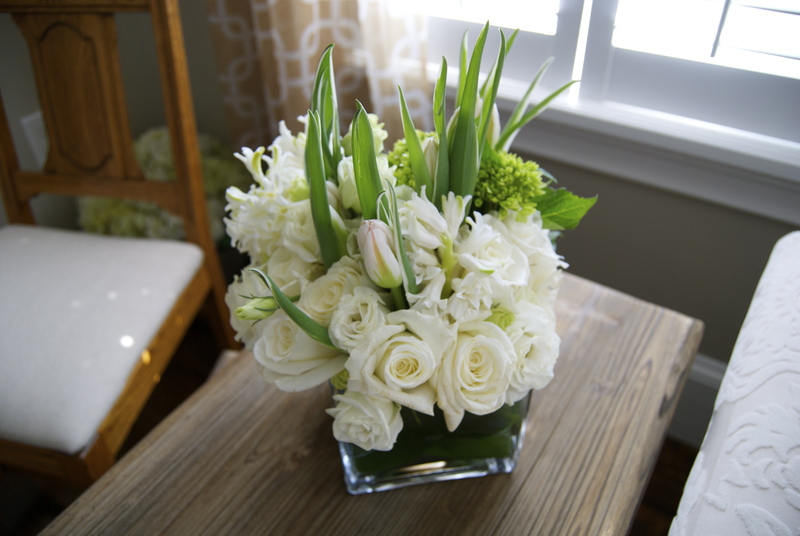 This beautiful arrangement came on Friday from my best friend Jamie (you’re the best James) and was the perfect size for my living room. 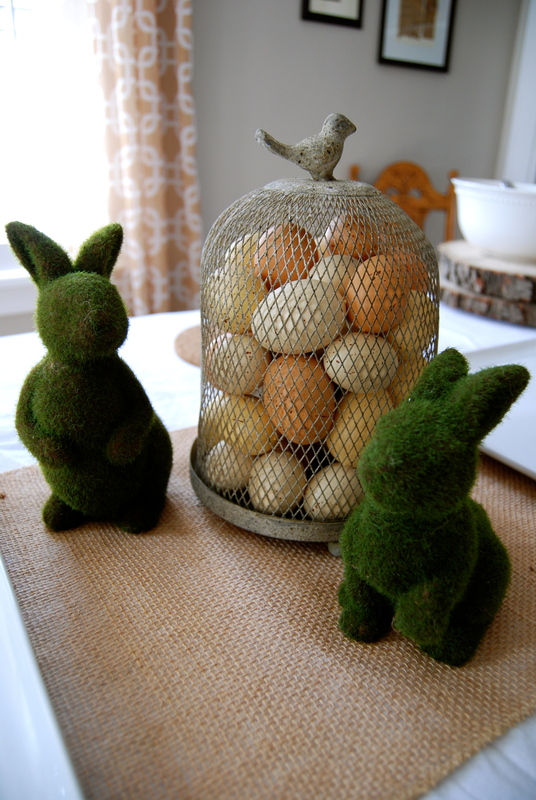 These little moss bunnies along with this birdcage candle holder that I filled with some faux eggs served as my centerpiece. 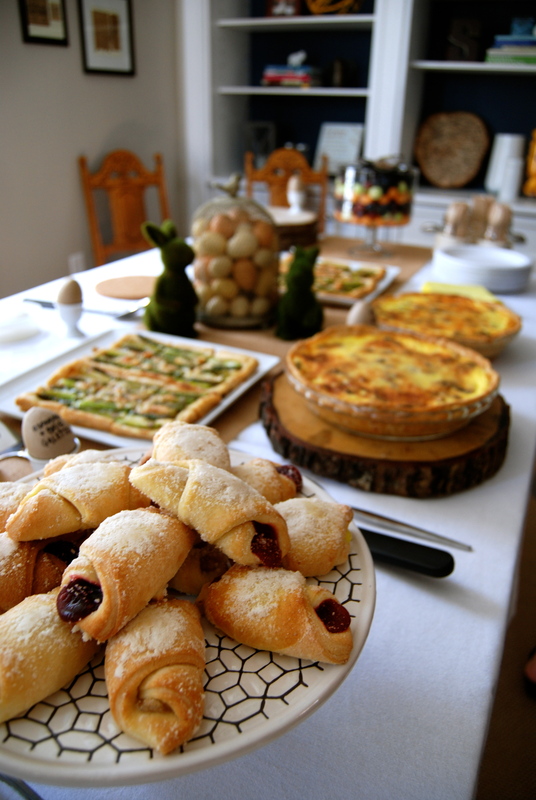 The table filled up nicely with bagels, pastries, a big fruit salad, my asparagus galettes, corn beef hash from Mum (to satisfy those pesky meat-eaters) and two beautiful quiches from my beautiful Aunt Lorraine- and despite her name, no they were not Quiche Lorraines. 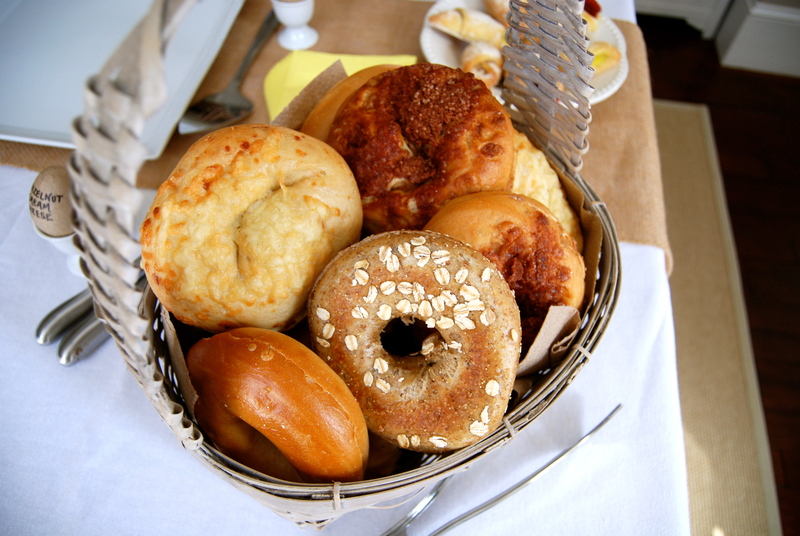 It was a successful Easter Brunch! 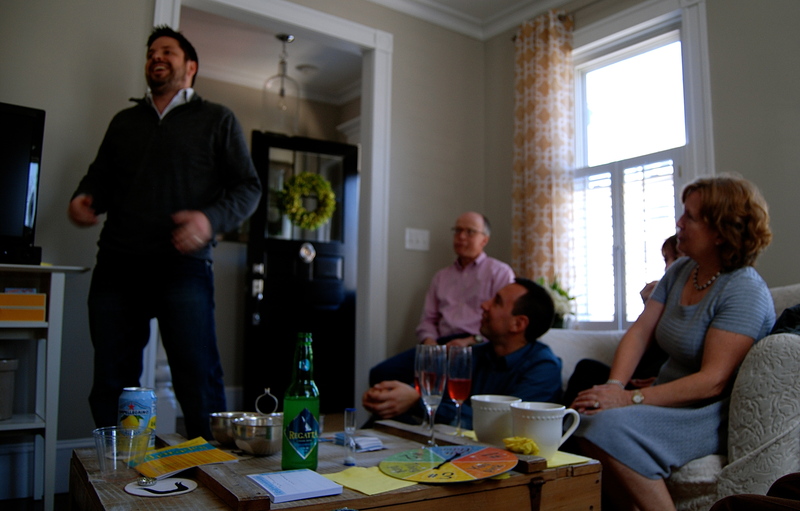 And after a couple of mimosas, the Family Charades Tournament commenced. Forgive the blurry photo but I couldn’t resist Jared acting out Plunging a Toilet! We were actually all much better at charades than we thought- although Scooby Doo, as we all found out, is very difficult to act out. Nice try Aunt Carina! In the end, Team A defeated Team B by just one point despite a last stitch effort by cousin Rachel. We’ll get ’em next year team! But only hearts can build a home. This past Friday, there were many hearts in our home. Our housewarming party was very much a success. Good food, good friends- it took my breath away to see so many loved ones enjoying our home and all that we’ve put into it. If there’s one thing that keeps me organized it’s lists. I had a good 5 lists going for this party: food, decor, shopping, hour-by-hour prep for day before and day of, and then an excel spreadsheet with all guests names, their addresses, their RSVP response, and a column for gifts to make thank you cards a breeze. Post-its are essential as well. The day before, I staged the party. Chairs were set out throughout the dining and living rooms, the table protected by a white table cloth and my go-to kraft paper, and all platters were set with labeled post-its. 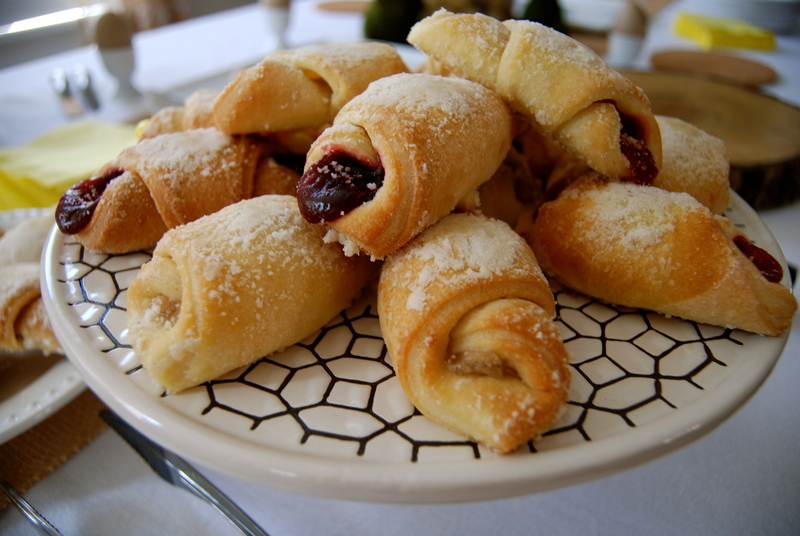 Then the morning of the party, I just made each platter and left the post-its on the table so I knew just where everything would fit just before the guests arrived. It was a wonderful party. Jared and I feel truly blessed to have so many wonderful people in our lives. We’re looking forward to many many more parties in this house! Thanks for coming everyone! I’ve shopped, and baked, and assembled decor but honestly, tonight’s party is really about our guests. It’s been a long year but we’ve made it through the bulk of this renovation. And If you’ve helped us in any way- through knocking down walls or putting them up, painting trim or laying floors, and especially in your kind words of encouragement and praise, we thank you. You’ve helped us build our dream home.